Forget about room service and boarding yourself up in your fancy Hollywood trailer. 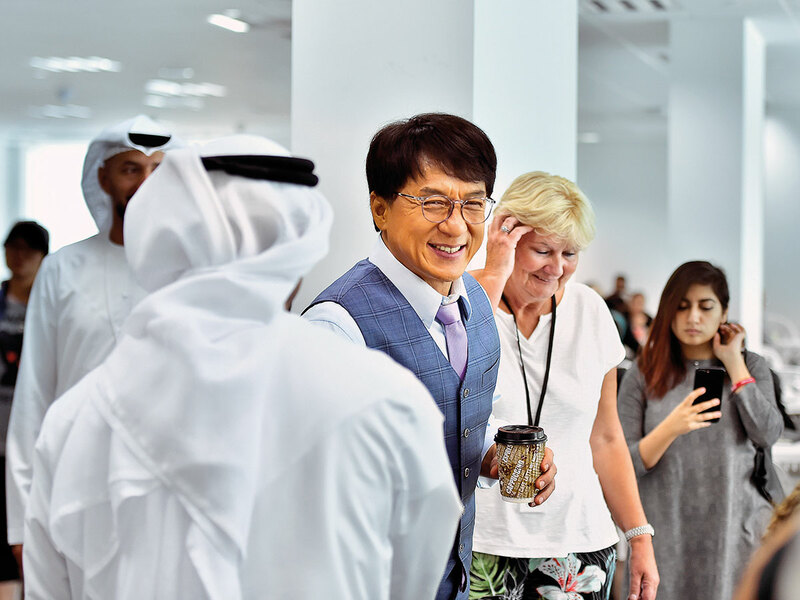 On Monday afternoon in Dubai, 64-year-old action hero Jackie Chan took a break from shooting his latest film, ‘‘Vanguard’’, to have lunch with his crew in a bustling catering room, where rows and rows of white tables were set up next to a buffet spread. If you were none the wiser, you would never suspect that Chan — wearing a check grey waistcoat and lavender tie — was somewhere in the mix. But that’s his modus operandi: man of the people first, global film icon second. “He is always with his crew. He prefers his crew to go and eat before him. As a person, he’s very humble,” said producer Ammar Al Khrisat. 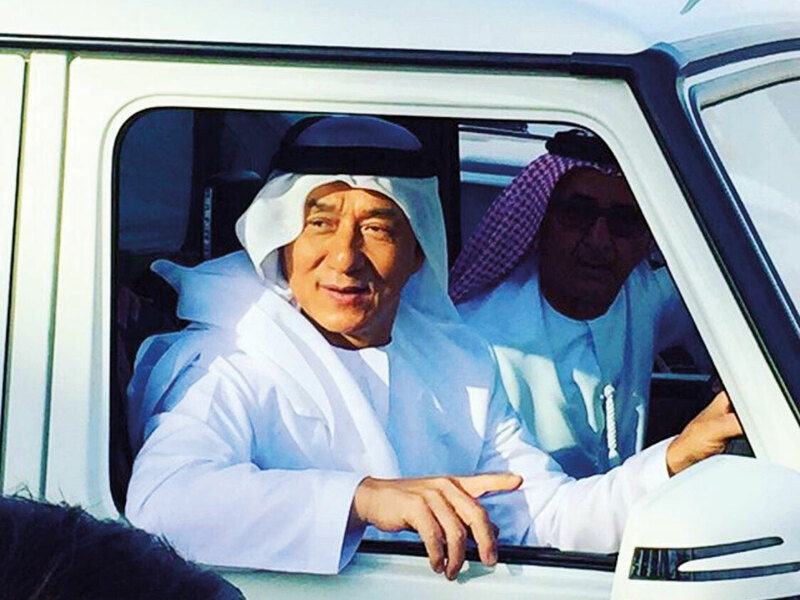 Chan first filmed in Dubai for the Indian-Chinese film ‘Kung Fu Yoga’ back in 2015. Falling for the city’s charms, he decided to return with director Stanley Tong to shoot another action romp this year. “We’ve been travelling around, every day, we’re looking at the building, the construction, whatever I can use [for] explosion, car chasing. At this moment, I was walking around the studio, and the studios are very good — and very clean, very organised,” Chan told tabloid!, during a chat at Dubai Studio City. “After ‘Kung Fu Yoga’, I go back, I tell all my friends — no matter Hong Kong, Taiwan, all the directors there — you should film in Dubai... When you film here, you’re comfortable,” he said. ‘Vanguard’ features an international cast — Yang Yang, Ai Lun, Zhu Zhengting, Jackson Lou and Miya Muqi — as well as Emirati and UAE-based actors. The crew has been shooting around Dubai for three weeks and will wrap up this week. 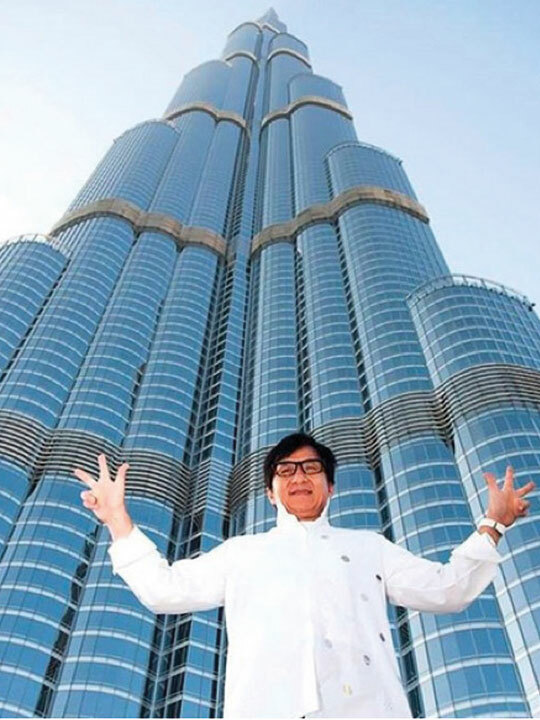 Jamal Al Sharif, chairman of the Dubai Film and TV Commission, spoke highly of lead actor Chan, who became famous for doing the majority of his own stunts. His previous roles include ‘Rush Hour’, ‘Police Story’ and ‘Rumble in the Bronx’. “He loves everyone... He has fans all over the globe. Remember, he’s not just a Chinese or Asian celebrity, he’s a global celebrity. They love him in [the] US, they love him in the Arab world. 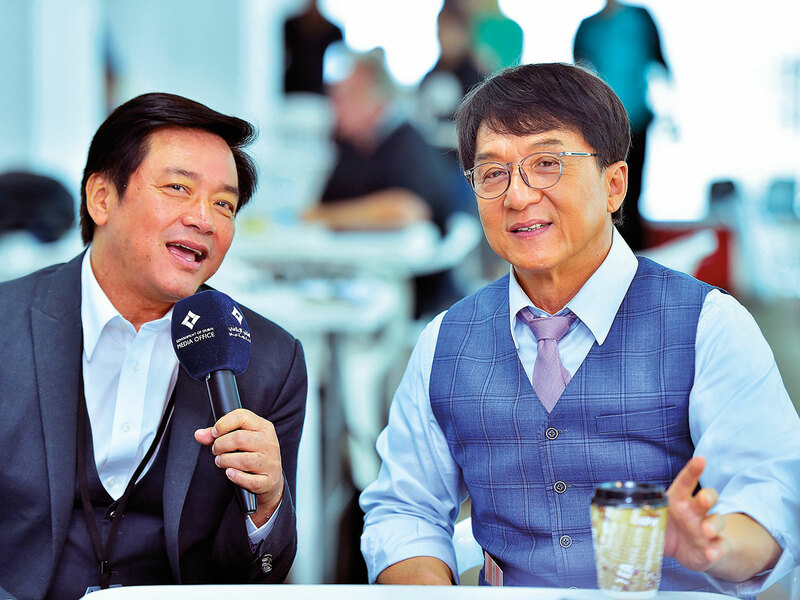 Every child who grew up with Jackie Chan today talks about him,” said Al Sharif. While Chan has brought happiness to millions, he took the time to comment on what happiness means to him. This, on the occasion of the International Day of Happiness, taking place today. “Whatever you do, do the best you can. More helping people. I do a lot of charity, and after I do charity, it makes myself happy. And besides that, every day, I wake up, [I do] training, make movie, [and] at night with my friend, have dinner. That’s [my] most happy things,” said Chan. Chan’s latest action-adventure film will see him play a hero once again. During shooting, Chan was only allowed to be a passenger in various police cars. But he held fond memories of getting behind the wheel during ‘Kung Fu Yoga’, where he played a renowned archaeology professor trying to locate an ancient Indian treasure. “Last time, I was driving every car. I showed the picture to all my friends, everybody [said], ‘Wow, it’s a super car!’” recalled Chan. “Dubai is a good place to film, so this is why we’re coming back. I believe, for the future, we’ll come back again and again. But I need all the police cars,” he said. ‘Vanguard’ filmed across the city, from Nad Al Hammar to Downtown Dubai, and everywhere in between. “For sure there will be something about Burj Khalifa. It’s an iconic tower, and it’s a symbol of Dubai now,” said Khrisat. While ‘Vanguard’ is set and shot in Dubai, the city has proven it can stand in for anywhere that a scriptwriter envisions it to be. “We always encourage the producers and directors to visualise Dubai as a futuristic city, like ‘Star Trek’,” said Al Sharif. Several films have portrayed the emirate as another geographical location or in a different climate. “In’ Mission Impossible’, Zabeel Saray was a palace in India. In ‘Geo Storm’, they shot Dubai in a big [tsunami]. In Bourne Legacy, they shot Dubai as the backdrop of Pakistan… We painted the curbs and brought cars to the right-hand side — even the sign boards were in Urdu,” said Al Sharif. The UAE has been a hotspot for action films in particular. Most recently, ‘Six Underground’, starring Ryan Reynolds and directed by Michael Bay, and ‘The Misfits’, starring Pierce Brosnan and directed by Renny Harlin, shot primarily in Abu Dhabi. “We work very closely with other emirates to attract more films to shoot everywhere in the UAE,” said Al Sharif. “There’s a big impact on the city when a film like Jackie Chan’s, or ‘Star Trek’, or ‘Mission Impossible’ or ‘Geo Storm’ is shot… For us, the longer they stay, the more economical effect it has on the city,” he added.